I LOVE Line by Line contests. I entered one way back in the day and it changed how I write my first pages. I also think it’s why Secret Girlfriend got me an agent in a week of submitting. Those opening pages were ready to go as I applied everything I learned to the rest. So, what is a LbL? We start with the entries (and, yes, I’ll be limiting them to the first 50 bc last time was 100 before the cut off time and it was IN-SANE). Everyone who is entered goes by their Title/Genre, so we don’t know who wrote which entry! Then the votes start. Depending on how many weeks I decide on, a certain number at the bottom get cut. ETA for clarity: We’re talking sentences. One at at time, starting with the very first one. ONLY post the first one on day one. Please look at the link at the bottom of the page if you haven’t already for the schedule AND a copy of the form so you know what will happen Tuesday when it opens. In the first rounds: ANYONE. Reader, writers, bloggers…even the entrants. But, when we hit a certain level, entrants can no longer vote. Sorry people who write hot on the first pages. The heat level is PG13. Oh, the rules — yeah. Follow them. I have zero issue bumping people who had been voted out. Any of these things will get you DQd. Great – let’s do this! Entries open on a new post on… TUESDAY AT 10am EST. Don’t forget: the first 50 entries only. So, get ready! 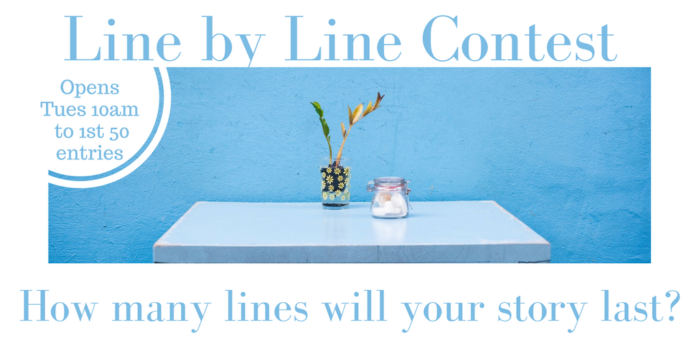 Start looking at your open now to know you can make several lines in a row bring the power! 10am, Tuesday – Grab a spot before they’re filled. ….and an e-copy of her book, Romancing the Beat (about beat writing for story arcs). Small print: the 5-page crits are all your the first five pages of the book you entered. And the final few will get to share their name and links, so if you win over those readers, you can grab them now! The schedule and a copy of the form for the contest HERE.